The one product that I always carry in my office bag is a deodorant. I used to take a bus to work and so a deo in my bag was a must! I can surely say that a deodorant makes you feel a lot more confident about yourself. I would hate to go near a colleague or a friend smelling like sweat and pollution. 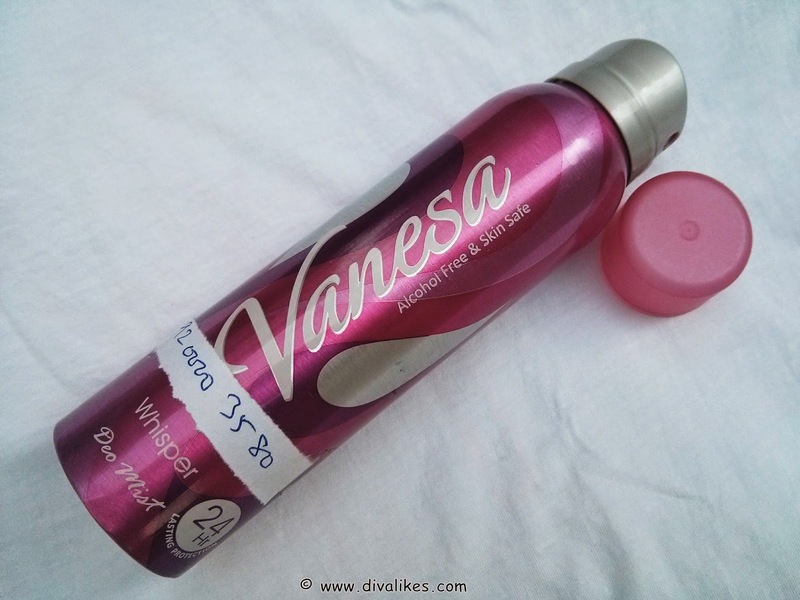 When I was sent Vanessa Whisper Deo Mist by Diva Likes, I was super excited. 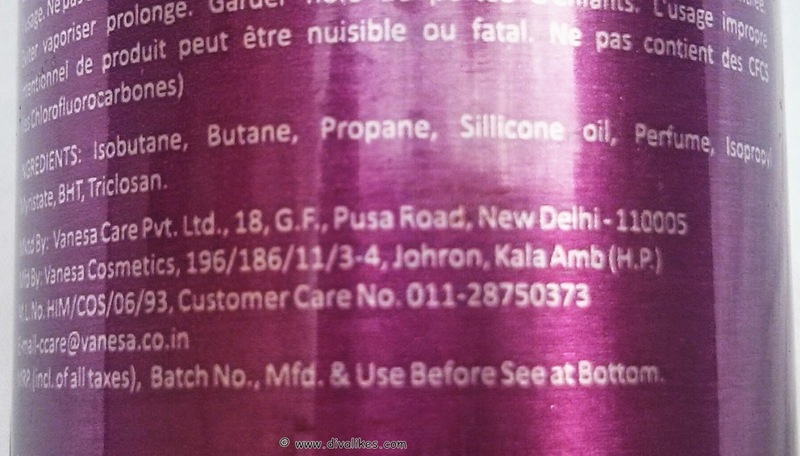 This is the first time I was sent a deo to review. As nervous as I am to deliver the right points, I am equally excited. Read on to find how this one fared! 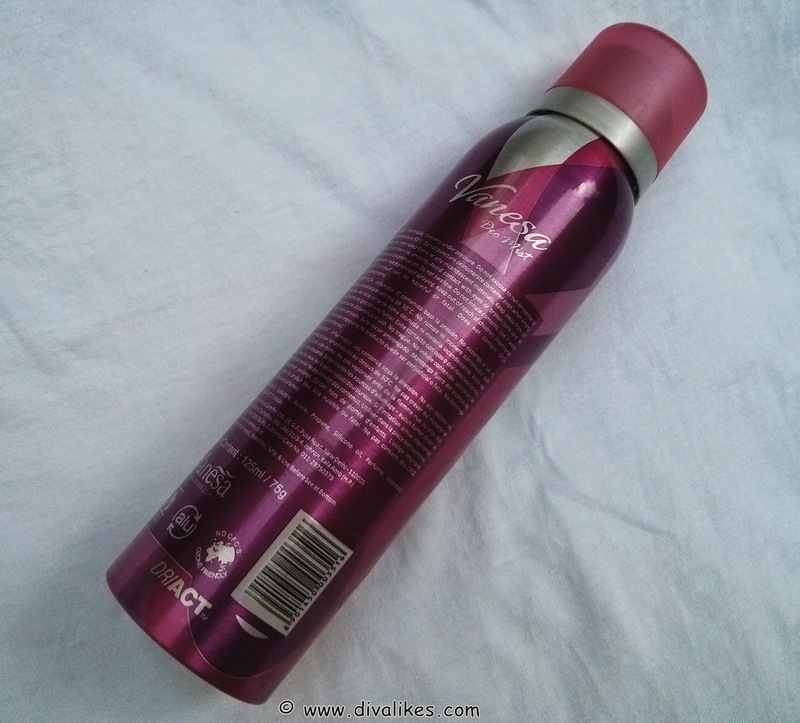 Vanessa brings this 'Whisper' deodorant, which will ensure you stay fresh and aromatic all day long. This long-lasting deodorant for women has a mesmerising fragrance and is perfect for day as well as evening time. This deodorant comes in a 75 g pack. 1. Always shake the bottle well before spraying. 2. Maximize the after effects by spraying on the neck and the wrists in addition to the armpits immediately after bathing. 3. Sprinkle talcum powder after spraying to keep the skin area dry & sweat free. It comes in a cylindrical tin container with a spray type dispenser. The container is pink in color and looks very attractive. The nozzle dispenser is made of plastic. It does not get sticky and dispenses the product with ease. The cap is plastic and feels very bendy. It keeps falling off into my bag. But other than that I think it is perfect for travel. When I carried the container before starting to use it, I felt the heaviness and arrived at a conclusion as to how much product is in there and how much of it is gas. It felt like there was 80% of the product and 20% gas, which is so much better than the other deodorants being manufactured out there. It smells like talcum powder, feels fresh & flowery. The smell for me is too main stream as I am more into musk. But those of you who like flowery fragrances would die for this. The smell might be a little too strong for a few as it gave me a headache after a while. 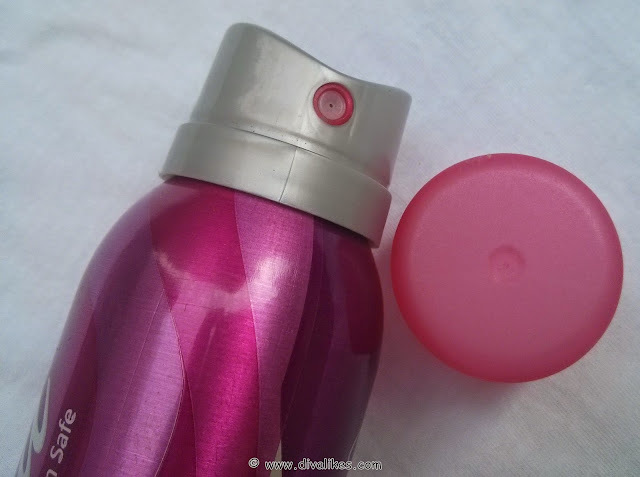 I use an anti-perspirant before using the deo and so I don't feel the wetness of the deo for too long. When used without an anti-perspirant, you will start feeling wetness in the under arms in just a few hours. According to the product description, using some talcum powder over the deo will reduce this problem. The staying power is really good as it stays for over 5 hours after which you might have to spray it again. The flowery fragrance is amazing. The quantity lasts for a good time. Makes you feel fresh all day. The cap of the deo keeps falling off. Causes wetness if not used without talcum powder or anti-perspirant. I would say this is a decent deo, even though it has a few shortcomings. It will come to your rescue when in need. People who love flowery fragrances will surely like it. The cap falling off is a turn off during travel...looks like an okay one!